It’s that time of the month again. Time for Taste & Create, a monthly blogging event where partipating bloggers are partnered off with one another; the partners browse each other’s blog and then they each have to cook their recipe of choice from their partner’s blog. Cool huh? This blog was authored and is hosted by Nicole of For The Love Of Food. My partner this time is Swati of Chatkhor. She’s from Bangalore, India and so naturally, all of her recipes are for Indian food. She is a vegetarian, but she’s started to venture into cooking chicken for her non-veg hubby. I’d say that’s love right there. I enjoyed reading her posts. I can tell she’s a fun person, who enjoys cooking so much. And her personality is obviously reflected in her cooking too. Swati, it’s a pleasure to be partnered with you. 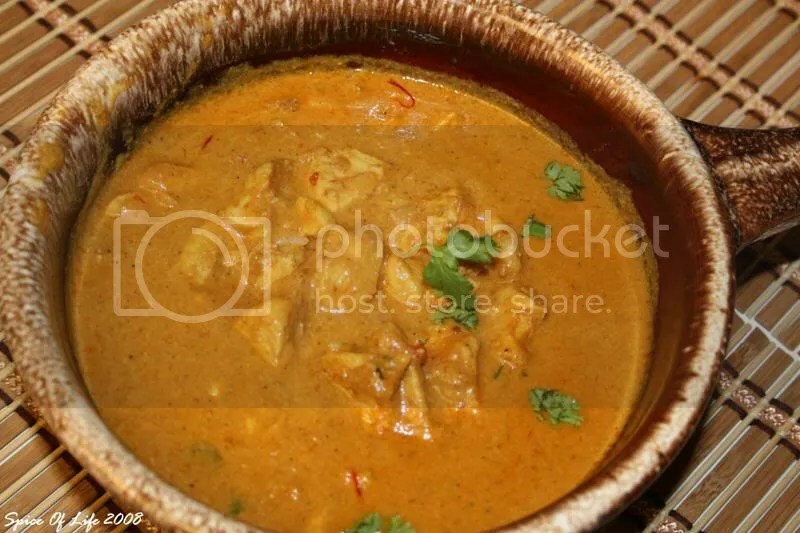 So in the end, I decided to do the recipe that Swati herself suggested – dum ka murgh zafrani, or chicken slowly cooked in yoghurt (check out the recipe here)… Doesn’t the Indian title alone intrigue you? I don’t think the changes I made affected the flavor of this dish at all. In my humble opinion, it’s really all the spices that make this dish. The sauce still came out thick and creamy due to the addition of the almond paste and the pureed tomato. At first, I was kind of iffy about the almond paste. I thought almond paste is only for desserts. I never knew that it could be added on to savory dishes as well, but now I know better.. haha! The paste added a slight almond taste to the dish, but not overpowering. And it made this dish a bit sweeter as well, which is a nice balance to all the different spices going on in this food. As it is only Mr. J and I at home, I decided to cut the recipe down into half. But even with half a recipe, it still made a lot, especially the sauce! But you know what, this food tastes better the next day, so I am not complaining. Cooking this dish transported me back in time when I was hanging out with pals from New Delhi (India) and Katmandu (Nepal). Almost 10 yrs. ago, I was in a scholarship program in Germany, which was sponsored by the German government. I got close to my colleagues from India (there were 2 of them) and Nepal. The smell of this dish as it cooked made me remember those good ol’ times when my friends would cook dinner, or at other times, when we would have Indian theme nights. We would go out to eat at Indian restaurants (in Germany), and watch Indian movies afterwards. Oh, I miss those fun times with them. I still communicate with these friends up to now, actually. Anyways, before I get carried away too much….. 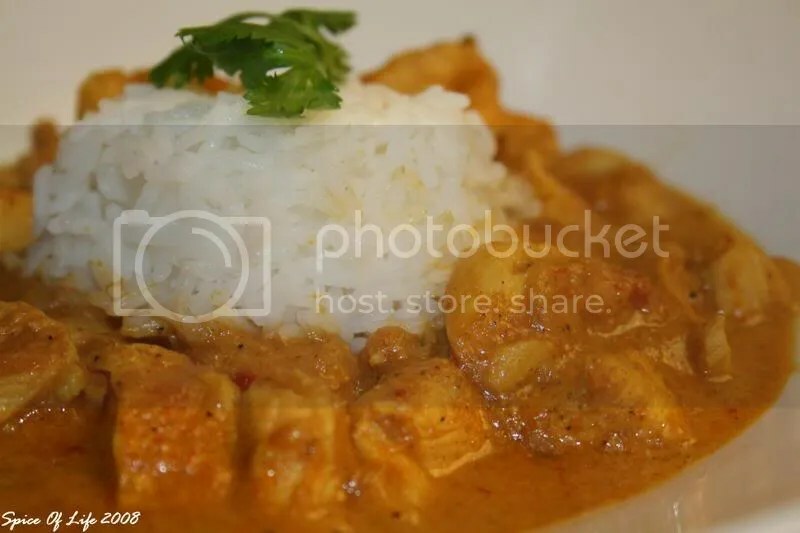 This dish is similar to curry, except that there is no curry in it. It had all the spices that one would expect in an Indian dish. The chicken was creamy and dreamy and I served it with plain boiled jasmin rice garnished with cilantro… Yum! My husband, who thought it was spicy, was surprised because the dish is milder than he had expected and slightly sweet. He actually liked it…Life is good…. Thanks, Swati, for a great recipe! 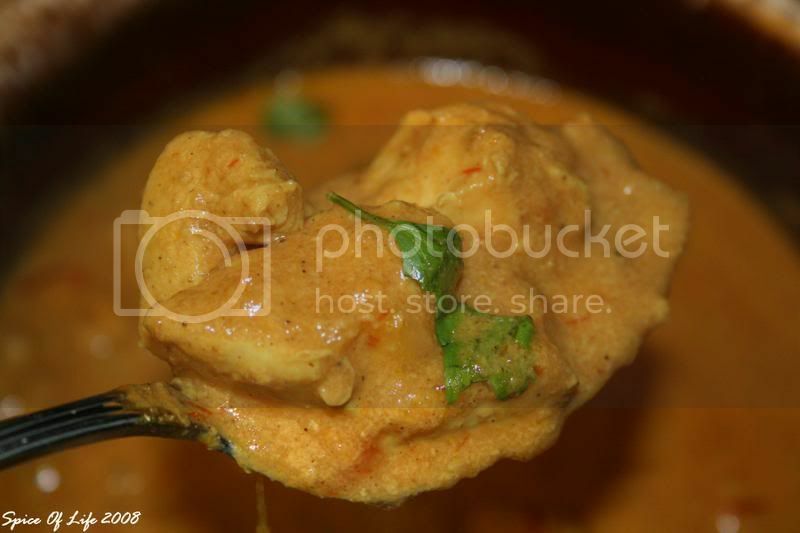 Came here from Swati’s blog..And found great non veg dishes here..Am a novice in making nonveg dishes and I am sure your blog would be of great help..
Diyva – i hope you will try some of my recipes. Thanks guys for passing by.